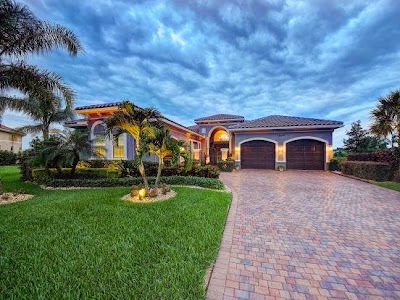 Florida Real Estate: Bay Hill Estates Home For Sale! Luxurious and Spacious! Bay Hill Estates Home For Sale! Luxurious and Spacious! This luxurious Mediterranean home is one of the newest additions to the upscale gated community of Bay Hill Estates. The neighborhood of Bay Hill Estates is located in West Palm Beach, Florida and is renowned for its upscale homes on generous amounts of land, and this lakefront home is surely not to disappoint. Situated on its own private cul de sac, this gem is one of the largest properties in the community. Sprawling over 4500 square feet, this Bay Hill Estates beauty offers 3 bedrooms, 3.5 bathrooms, and 3 car garage. Outside you will fall in love with the custom built vankirk pool and spa, with a gorgeous travertine marble decking. The peaceful pool fountains and LED light fixtures combine to create either the perfect setting for entertaining guests or for utter relaxation. Indoors you will find luxury kitchen equipment including an island, wet bar, bedrooms containing enormous walk-in closets, and built in shelving throughout. Bay Hill Estates has many amazing amenities to offer including a tennis court, basketball court, playground, soccer fields and so much more. This gated community is surrounded by acres of natural preserves and world class golf courses. The preserve is the newest addition to this neighborhood and does not fall short of its name, you will find yourself closer to nature within the lush environment that will be beckoning you to the luxury in within the wilderness. Ideally located within moments away from Florida’s Turnpike offering easy access to all Palm Beach has to offer.